The Duzan family has found their four-year battle to regain custody of their intellectually disabled daughter, Sara, and bring her back home, to be extremely expensive. In arrangements that raise some troubling questions, the family has been required by court orders to pay over $13,000 so far to three professionals in the probate court case. Among those payments is $5,000 so far to a Special Master, even though the family was never provided with a written agreement or invoices by the Special Master for her charges. In addition, the family was required as a result of a probate court order to pay $5,750 to a psychologist to evaluate Sara last May, even though the evaluation was never done and Sara had previously been evaluated by a different psychologist. And the family was required to pay $2,500 for a report on the case in 2010 from an attorney who had been appointed as a guardian ad litem in the case. The attorney made recommendations to the judge regarding a dispute among parties in the case, but the charge for the attorney’s services was given to the family to pay. Maryann Duzan, Sara’s mother, said the probate court left it up to the three professionals themselves to determine the amounts the family should pay for their services. “It was just a given that our checkbook was theirs,” she said. The Duzans have refused to sign a proposed contract for guardianship services submitted to them by Sara’s current court-appointed guardian, which specified charges of $200 per hour each for the guardian and another attorney in her law firm in addition to charges for other personnel. “That would have bankrupted us,” Maryann said. Despite the payments they have made and what they say is their life savings paid in legal fees, the family has seen increasing restrictions placed on their contact with Sara. They are currently forbidden from even contacting her by telephone in her residence. Sara, who has a rare genetic disorder called Smith-Magenis Syndrome (SMS), has been living in a residence run by Becket Family of Services, a state-funded, corporate provider, since July. The family has not been allowed to see her since June. 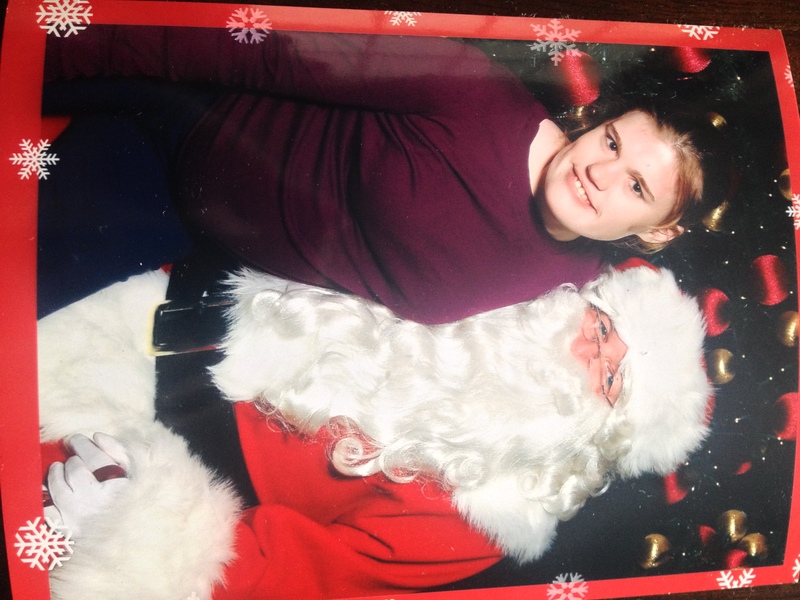 A photo of Sara taken with Santa at the mall, when Sara was last living at home. She was last at home between November 2011 and January 2013. SMS is a disorder characterized by intellectual disability and behavioral outbursts. The Duzan family maintains that SMS is poorly understood by many care providers, who often place persons with SMS in confining restraints when their behavior becomes aggressive. The Duzans contend restraints are counter-productive in those cases because they tend to make the behavior worse. SMS is also poorly understood by the probate court, the family maintains. The court ruled the family unfit as guardians in 2010 because they were allegedly being uncooperative with providers and acting as if they “know best” about Sara’s care. But in the past several days, the family has received an outpouring of support from friends and members of a network of families of children with SMS. More than two dozen members of the SMS network submitted comments to this blog, backing up the Duzans’ contention that restraints should not be used with persons with the disorder, and calling for Sara’s immediate return to her family. The Duzans say they never used restraints when Sara lived at home, but they are concerned that Sara is being subjected to excessive restraints in her current residence. They also claim Sara was abusively restrained in at least two previous residences run by state-funded providers. In one of those cases, the family’s claims were corroborated by a disability rights center attorney who found that Sara was subjected to excessive and unnecessary restraints between 2008 and 2010 at the Spaulding Youth Center in Northfield, NH. Maryann and her husband, Paul, first relinquished their guardianship of Sara in 2009 after the Massachusetts Disabled Persons Protection Commission (DPPC) began investigating allegations that the Duzans themselves had been abusive toward Sara. However, none of those allegations were substantiated other than an admission by Maryann that she once slapped Sara on the cheek while Sara was acting aggressively on a home visit. The probate court judge, who ruled the family unfit to be Sara’s guardians, concluded in 2010 that the Duzans were a loving family toward her. I sent Barnes an email yesterday, asking whether she supported the decision to cut off all communication between the family and Sara, and whether she was confident that Sara was not being subjected to possibly excessive restraints or otherwise being harmed in the current residence. I also asked if Barnes would comment on her fee arrangement with the family. I had previously left a phone message with her. I haven’t heard back from her. Turner, who was appointed Sara’s guardian in December 2011, proposed a contract for her guardianship services for Sara that would have required the Duzan family to pay fees of $200 per hour to Turner, $200 per hour to another unnamed attorney in her firm, and $75 per hour to a paralegal and $25 per hour to a clerk in the firm. The proposed contract was signed by Turner, but the Duzans refused to sign it. The contract refers to a court order that the family pay for Turner’s guardianship services, but Maryann maintains there was never a court order to that effect. I also sent Turner an email yesterday, asking if she supported the cutoff in communication between the family and Sara, and whether she was confident that Sara was not being subjected to possibly excessive restraints or otherwise being harmed in the current residence. I also asked whether she had a justification for what seemed a high proposed fee for her guardianship services. I haven’t yet heard back from her either. The family paid a total of $5,750 in May of this year to psychologist Ronald Ebert as per a probate court order even though Ebert never evaluated Sara because she refused to meet with him. Nevertheless, the family was billed by Ebert for the research, travel, and other work in connection with the proposed evaluation. A February 22 memo written by a clinician at the Latham Centers, where Sara was placed from January to July, states that Ebert arrived that day to interview Sara, but never evaluated her because she refused to come out of her room. A May 5 invoice from Psychological Services, Inc., Ebert’s firm, specified a fee of $250 an hour for research into the case, interviewing the family, travel from Newton to the Brewster location of the Latham Centers facility, and preparation of a report. Maryann contends Ebert’s evaluation wasn’t actually necessary because another psychologist had evaluated Sara a year previously. In his report, Ebert described the family as “concerned and active,” and noted they were frustrated in their attempts to get adequate services for Sara. Much of Hill’s 9-page report concerned allegations from providers and two school system officials that Hachy was not sufficiently independent of her mother, Maryann, to make effective decisions as co-guardian. Maryann was described as being uncooperative with professionals and an “obstruction.” Hachey denied she was controlled by her mother, and said Smith was making decisions without her input. Hill noted in the report that Sara herself said she wanted her sister to remain as her guardian. During a trial in July and August 2010 on the family’s fitness for guardianship, Smith testified that he probably would have slapped Sara himself under the same conditions that Maryann faced when she admittedly slapped her, according to a brief filed by Suzanna Urukalo, who served as an attorney for Hachey during the trial. Urukalo’s brief added that Gail Quinn, Deputy General Counsel for the DPPC, stated that she believed the Duzans to be “caring and loving parents who are very involved in their daughter’s life in order to provide her the best.” Quinn nevertheless filed motions with the court to remove all of the Duzan family members as Sara’s guardians. We have already said we believe Sara should be returned to her parents. After examining the lengthy record in this case, we see no reason why Sara is being kept isolated in the Becket residence without any contact with her family. As many of the people who commented on our previous post have noted, this situation is an outrage and a human rights violation. The fact that the family has been forced to pay many of the parties in the case out of their own pocket — and that they have only seen the restrictions on their contact with their daughter tighten — compounds the terrible wrong done to them. Please sign COFAR’s petition on change.org, asking Governor Deval Patrick and Department of Developmental Services Commissioner Elin Howe to allow Sara to return home to her family immediately. This story is very disturbing to think a family has such a fight to get guardianship back for their own daughter. Legal fees are outrageous considering several of the services were never even provided. should be held accountable—all—including Dr. Bigby and her successor, and especially the DDS service coordinator.